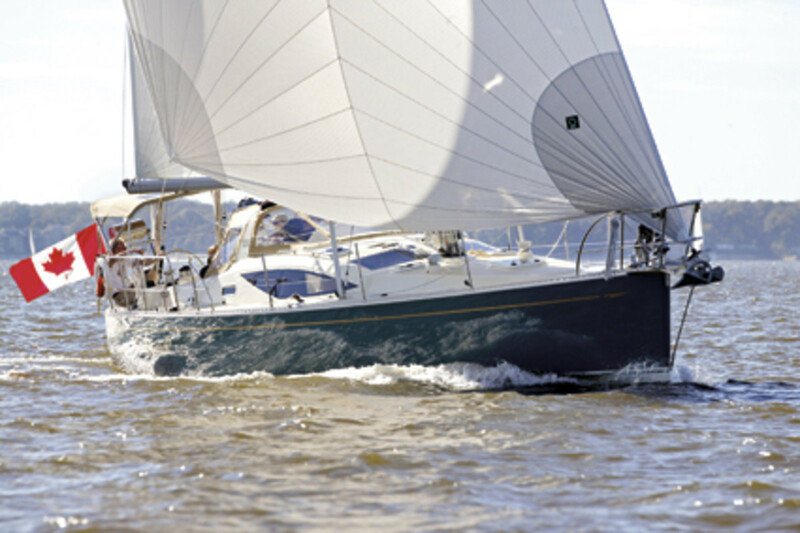 If you want to see a dramatic example of how far monohull cruising boats have evolved in the past couple of decades, study the Saga 409 for a while. Its blister-coachroof/deck-saloon configuration opens up the interior and makes space for vital systems below while looking sleek from the outside. It has beautifully curved cherry bulkheads and doors that look as if they might have been carved by hand (they’re actually super-strong vacuum-bagged laminated veneers that save speed-sapping weight). More than drawings or photos can show, this Tony Castro–designed boat is a head-turner. Under main and Code Zero headsail, in 10 to 12 knots of breeze, the 409 accelerated smoothly to 7.5 knots and stayed there, knifing through the slight chop without fuss. The long waterline and low ballast should give a stable platform in rougher conditions offshore, too. Upwind, we tacked through 85 degrees and logged 6 knots of boatspeed. Walking about on deck and below was safe and easy; the builder installed lots of handholds. The helm feel is excellent, sight lines are clean, and tacking and gybing are simple, thanks to well-laid-out controls. Cruising-speed motoring was predictable and close-quarters maneuvers posed no problems, as the 409 stops, turns, and backs easily. Sound level below under power was average. The cockpit is exceptionally comfortable. The backrests are high for excellent support, the seats are long enough to sleep on, and the centerline table makes a good foot brace when the boat heels. I like the open passageway to the transom created by the dual wheels, but I am not as enthusiastic about the additional mechanical complication it requires. It is certainly convenient to have the helm so close at hand no matter where you stand. Detailing has always been a Saga strength. The liferaft and ditch bag fit neatly into a seat locker, the berths have leecloths, and the galley felt secure when I wedged myself into cooking position underway. I especially liked the extendable nav table, which is compact if you want to do everything electronically but can expand to fit paper charts. The cabin stowage is secure, too; latched doors ensure that the book collection won’t come tumbling down when the seas kick up in the middle of the night. With labeled through-hull shutoffs and neat wiring and plumbing, the systems also are well designed. The Saga 409 is a solid, stylish, and comfortable cruising boat that offers a glimpse of where cruising-boat design appears to be headed in the twenty-first century.